Gregg K. Abe is entering his 31st year as director of bands at Roosevelt High School. A product of the public school system in Hawai'i, he graduated from Roosevelt and went on to receive his Bachelors of Education degree from the University of Hawai'i-Manoa in 1983. Prior to his appointment at Roosevelt, Mr. Abe was employed at James B. Castle High School in Kaneohe, Hawaii where he directed the concert band and two jazz ensembles. He is an active member of the Oahu Band Directors Association where he holds the office of treasurer and is also a member of the Hawaii Music Educators Association. In addition to his teaching duties, Mr. Abe is also a part-time member of the Royal Hawaiian Band and a freelance musician in Honolulu. 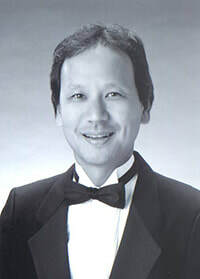 He was the 1996 recipient of the Hawaii Music Awards Outstanding Music Educator and the 1998 State and Southwest Regional winner for of the ASBDA-UMI Distinguished Band Directors Award in the High School Division. Most recently he was recognized by the Hawaii Youth Symphony Association and School Band & Orchestra Magazine for his contribution to music education. In 2017 he was officially elected into the John Philip Sousa Legion of Honor.